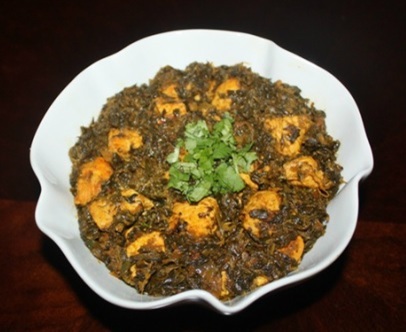 ﻿C﻿hicken saag (Chicken curry with spinach) is one of the delicious north Indian traditional dish. It is an amazing combination of chicken and spinach. When chicken and spinach cooked together with onion, garlic and tomatoes it makes an awesome main meal dish. It provides protein and vegetable into one dish. Chicken is well liked all over India, and every reign has different style of cooking. 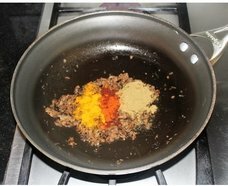 Chicken is cooked with different combination of vegetables. 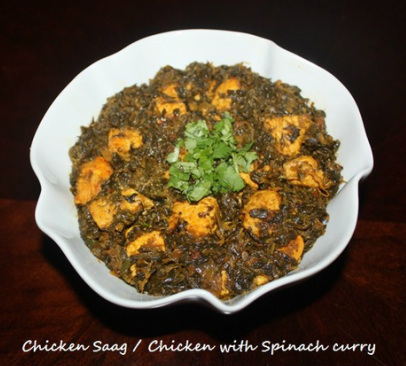 Chicken saag is a wonderful blend of chicken curry and spinach. Serve this tasty dish with Naan, chapattis and rice. 1. Thaw the spinach. If using fresh spinach then wash and chop the spinach. steel pan. Add minced onion and garlic and sauté, while periodically stirring. fry for 8 to 10 minutes or until onions become light brown. onions and fry for few seconds. 8. Add tomato puree or tomato sauce and yogurt, mix everything together. With the tomatoes and yogurt onion masala becomes watery, turn the heat to high for 2 to 3 minutes, so that water evaporates quickly and then turn the heat down. and you see the oil in the pan that means onion masala is done. and mix with the chicken and spinach and cook for another 5 to 8 minutes. wish you can skip adding butter. dish and garnish with coriander leaves. 2. One pound of fresh spinach will yield 10-12 cups of torn leaves, which will cook down to about 1 cup. One package (10 ounces) of frozen spinach leaves yields about 1-1/2 cups after cooking. Therefore, you can substitute 1 package (10 ounces) frozen spinach leaves for 1-1/2 pounds of fresh spinach.